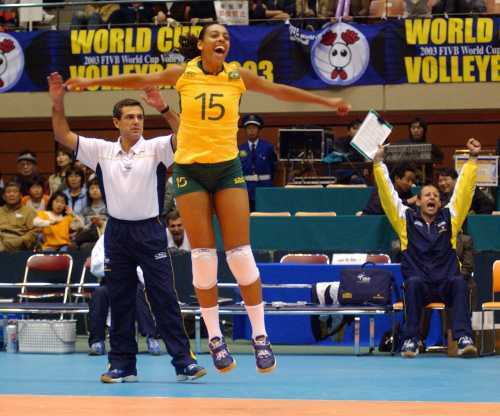 Arlene Xavier is one of the most precious jewels of Brazilian volleyball. The player, who was present in Brazil’s first Superliga season in 1992, is still going strong today, having participated in every one its editions so far. One of the most complete players to ever grace the country’s courts, Arlene started out as a middle-blocker, but occasionally played both hitting positions when needed, winning several individual accolades along the way. However, it was when the position of libero was created, that Arlene really shined. She was invited by legendary coach José Roberto Guimarães to become one of the country’s first players at the new position, and debuted with Brazil’s national team in the 2004 Olympic Games. 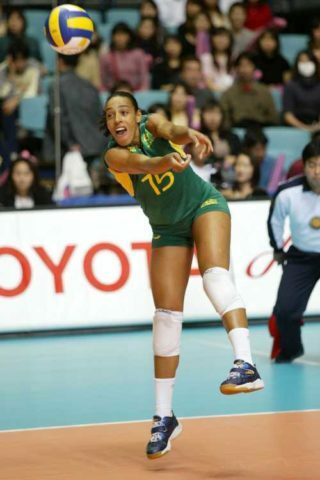 She has since then become one of the most decorated Brazilian players at the position, playing in Superliga’s most important teams, and winning several best libero awards in domestic and international competitions. Arlene, the American public best remembers you as a complete middle blocker, acting in several positions when needed. You were a great passer and blocker, having won awards for these skills in various competition. Then, the libero position was created, and you excelled in it. How did you deal with the challenge of changing roles? Do you see any players in today’s game with fundamentals so solid that he/she could play any position on the court, much like you and Ana Flávia did back in the 90’s and 00’s? The creation of the libero position was great because it gave the opportunity for spikers to continue playing past their youth days if they did not reach taller heights. In my case, the position change was beneficial because it served as a way to lengthen my career. At first I resisted a little bit, because I liked to attack. I remember that in the first year of the change, José Roberto Guimarães let me do the normal warm-up procedures, attacking and everything, and only at the end of it all, he warmed me up on defense. I feel that today it is very hard for us to see middle blockers with enough skill development to play in the back-row. Players are directed to their positions at a very young age. The most skilled are chosen to be outside hitters and setters, the tallest are chosen as middle blockers, an the strongest as opposite hitters. With this, some players lack even the most basic of fundamentals. We need to rethink the way our athletes are being trained. You’ve played for the best clubs in Brazil, such as Minas and BCN, as well as with the best players and coaches in the sport. In your extensive career, who do you consider to be your biggest influences? I had the opportunity to train with the best, so it is difficult to talk about one person in particular. I regret that I did not have the opportunity to train with Bernardo Rezende (Bernardinho), but I believe that without a doubt, José Roberto Guimarães and Bernardinho don’t need any kind of introductions. They are by far the best volleyball has to offer, and they heavily influence many aspects of our sport. I’m grateful to have met both of them. You were present in perhaps the saddest episode of Brazilian volleyball history, the defeat against Russia in the Athens 2004 semifinals, after being up 2-0 and sporting a 24-19 lead in the third set. How did you deal with that traumatic defeat to move on and continue to stand out, later winning gold and the best libero award in the 2006 FIVB Grand Prix? Losing is never good, especially the way it happened in 2004. At that moment I felt it a lot, because I knew I would not have another chance to play it the Olympics and win a medal. Still today some people ask me what happened, but the answer is always the same: “IT WAS NOT MEANT TO BE.” When I returned to the team, I told myself, I WILL BE THE BEST. And indeed, it happened. It just was not better because I was cut from the team shortly after arriving in Brazil from the Grand Prix. I trained and I dedicated myself a lot, and in spite of everything, going back to the team was great !! I cried, smiled, and keep everything in my memory with affection. I once asked my wife, who played a season with you back in 2015, who was the most dedicated player she ever worked it. She said that the answer would have to be you. What keeps you motivated after so many seasons, having already played in the Olympic Games, and won so many titles and individual awards? I always liked to train a lot, because I started playing late. I knew that I needed to dedicate myself at my maximum to grow every day. After going through difficult situations where people, out of pure prejudice and lack of knowledge, begin to question your potential, you just need to run more. I do it with love and dedication, for the sport and for everything around me. I like the challenge, to overcome my limits, and to break paradigms (laughs). At the end of the last season, you announced your retirement from volleyball to take on an assistant coach position in Vôlei Bauru. You later decided to come back and play for one more year. Can we expect the same this year, and see you playing one more season? Do you still want to become a coach. If yes, how do you see yourself leading a team? When I announced my retirement, I was in a very bad emotional moment, as I had just lost my mother and that season was not a good one for me. Fortunately, my plans did not work out, and I when I had the opportunity to go back to the court, I grabbed it both hands. I want to play another season. I do not think I fit the profile needed to be a head coach, but I would like to contribute in some way, and after learning more about it, maybe I can change my mind. You’ve gone through all major volleyball changes in your career: the creation the libero position, the end of the side-out era, etc. 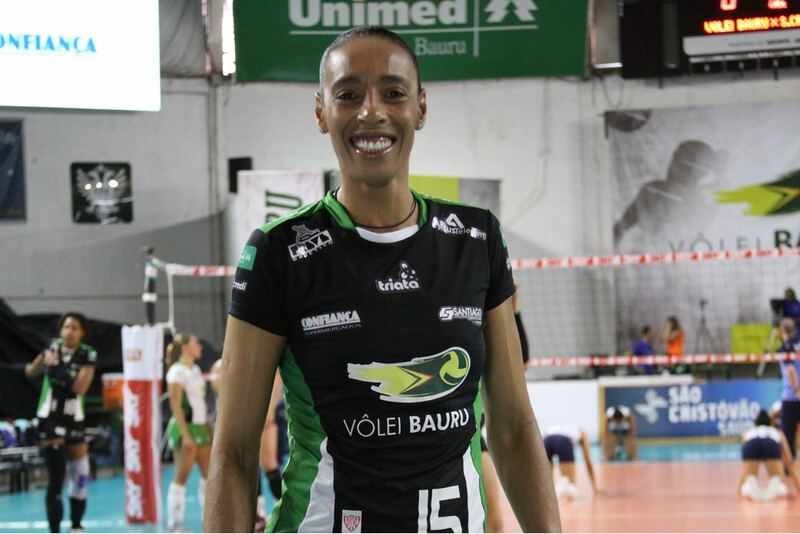 Also, this season you played with Tifanny Abreu, the first trans player to act in Brazil’s female Superliga. Would you care to comment what this means for volleyball going forward? Having seen all these changes in volleyball was cool, some were very good for the preservation of athletes’ health. I have been on the team with Tiffany’s this season, it was a nice experience. Although I see and read a lot on the matter, I haven’t yet formed an opinion on it. I prefer to let the competent bodies decide about it, because even so, if she was cleared to play this season, it is because it was allowed.